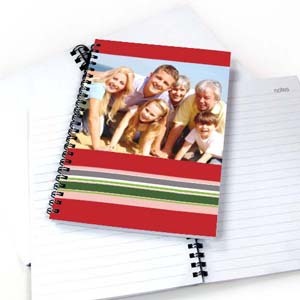 Personalized note books are great gifts to give to anyone on any occasion, such as birthday, Easter or holiday season. All you need to get started to make your personalized note book is some creative. At PrinterStudio, you can easy make your own paper notebook online using our web-based editing tools. Just upload a photo or a picture, drag and drop image to one of our pre-designed notebook template. What makes our notebook gift all that more treasured is that all side of the notebook including inside front, inside back and the back are fully customizable. Unique and funny design notebooks are unique gift ideas for back to school and they are practical gift for kids, birthday gifts for kids, birthday party favors and special gifts for teachers.